UNITED NATIONS, June 25 -- As one Latin leftist was declared sick unto death by the UN, another was defended but no questions taken. 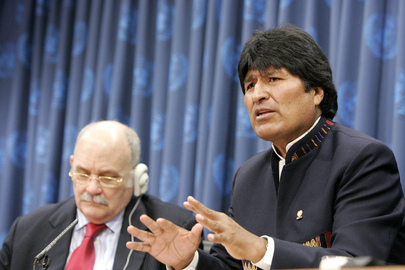 Bolivia's Evo Morales canceled his appearance at the UN's summit on the global financial crisis. Inner City Press asked Ecuador's President Correa about reports that the plane Morales would use to fly to New York was broken. Video here. Correa's answer, as translated into English by the UN, was that "Evo Morales was coming, but he fell ill, they were not able to fix that malady." Video here, from Minute 25:03. Later on June 25, it was announced that UN General Assembly President Miguel d'Escoto Brockmann would hold an "urgent" press conference with Honduras' UN ambassador at 6:40 p.m.. Inner City Press went, eager to ask questions. 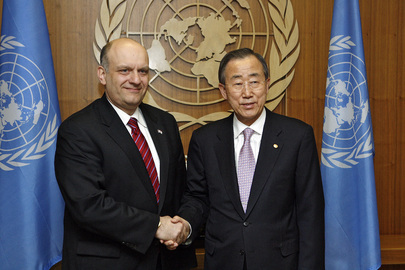 But d'Escoto read a statement and then said he had to leave, to a party upstairs in the UN. Honduras' Permanent Representative left as well. They claimed a military coup, and then went to a party. Coups de Champagne? Evo Morales and PGA d'Escoto: the former deemed by UN "ill," "unable to fix that malady"
Later still on June 25, Inner City Press ran down to the stakeout in front of the tail end of the day's testimony in the General Assembly. The last speakers where the UN ambassadors of Tanzania, Kazakhstan and Liechtenstein. The latter, Inner City Press wanted to ask about his role in a letter to the International Criminal Court about judges who rules on the case of Omar al-Bashir now accepting posts on the appeals panel that might still hear the case. He said, it's not ideal -- to be covered at more length later -- while other Ambassadors and Joseph Stiglitz streamed out of the reception d'Escoto has hosted up in the Delegates' Dining Room. Partying while the Supreme Court rules against you, trying to use the Press as stenographer while taking no questions -- this is d'Escoto's General Assembly, but hopefully not the next. Watch this site. 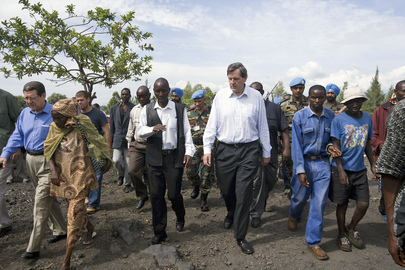 UNITED NATIONS, June 25 -- Following questions about Nigeria imposing life sentences on 27 soldiers who had served as UN peacekeepers and then were not paid, top UN peacekeeper Alain Le Roy provided an update to the Press on June 25. "I raised the point myself with the Minister of Defense of Nigeria," he told Inner City Press. 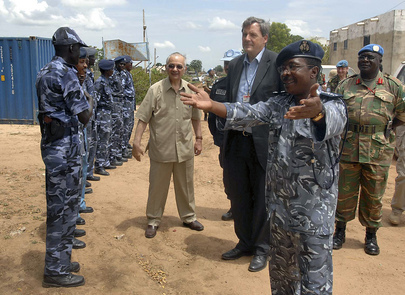 "The peacekeepers did a good job where they were, they came back and they considered themselves unpaid, and made a demonstration." Inner City Press asked Mr. Le Roy why they had not been paid. Le Roy sited a "mistake in name, other were paid instead of them. Some were condemned and punished." But, he added, "the Nigerians said that soldiers' demonstration is considered as mutiny. According to military law, for mutiny there is only one sentence, which is life in prison." What then is going to be done? "They are now appealing, two times if they lose the case," Le Roy said, adding, "I advocated for that, I considered that the solider had made a good job on the terrain.... Military courts, we are all fine with that. But we hope there will be a, how do you say, indulgence." This last was said with a French accent. Later on Thursday, Le Roy stopped Inner City Press again, to emphasize that Nigeria is a sovereign country and has made no promises about the outcome of the peacekeepers' appeals, nor about granting any indulgence -- it has only been asked for. Footnote: Le Roy confirmed that Nigeria General Martin Luther Agwai will be leaving his post as Darfur mission force commander at the end of August. Inner City Press ran by Le Roy the nationality of his replacement and there was nodding, along with a statement that it hasn't yet been made public, "it is not official yet." In this case, in context, we can and will wait. Watch this site.